“I’m a licensed cosmetologist. I was thirteen when I started doing hair and stuff. I just wanted to make everybody look pretty. We would go out and my friends and I couldn’t afford beauty salons and so I was the one doing everybody’s hair. I just continued to do that. After high school, I went to Central High, I went to hair school. It was Roy’s Beauty Academy when I went. It was off of Chenoweth Lane, so I did that and finished. I worked at two salons before I went and got my own. I’ve been here for seventeen years. April 21st made seventeen years. I work with my family, my nieces. They’ve been with me for more than eight years. They’ve always been in the salon with me, you know, hanging out and stuff. I’m here to help them and educate them on having their own business. Stay where you are until you get to where you’re going. They want their own and one of them wants a wig shop. I’m here to help them. What’s kept me in business for so long? It’s the professionalism, personality, no drama, and it’s just a peaceful atmosphere. It ain’t where you’re at but who’s in it. 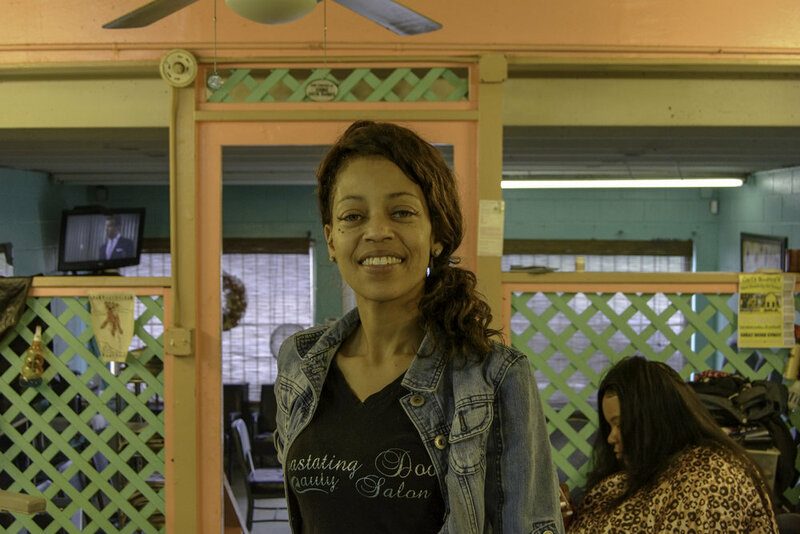 You can have a million dollar salon but it’s the people in that won’t make it run. I’ve had people that’s been with me since I started and I’ve been doing hair for twenty-five years. I’ve got a Dudley Award for nineteen years plus. I’m with Dudley and I’ve received an award last year, the Never Give Up Award, from Dr. Joe Dudley. I’ve been in magazines, too. I’ve thought about moving out of the West End but then I thought that this is a landmark. You have to continue education, that’s the key. You have to keep up with the younger generation. My older generation has children and their children had children. It’s like a family thing because they’ve all stayed with me. I deal with generations. When it comes to my work, I think of that person. I don’t just think of a style. It’s about how I want them to look and how I want them to feel better about themselves. It’s not about me, it’s about them and keeping their hair together. So, whoever comes out of here, I want them to look nice and right because they represent. Stay professional and leave attitudes at home. You never know how the next person’s feeling. So, us, as business owners and cosmetologists, we have to be there for our clients, as a counselor, guider, provider, listener, or anything that will help them out. You never know what they’re going through. I have talked to people who were so depressed and I was able to help them out. That makes me feel good, just to know that I can be there. That’s what keeps me going.